Authors: G. Christian, G. Lotay, C. Ruiz et al. 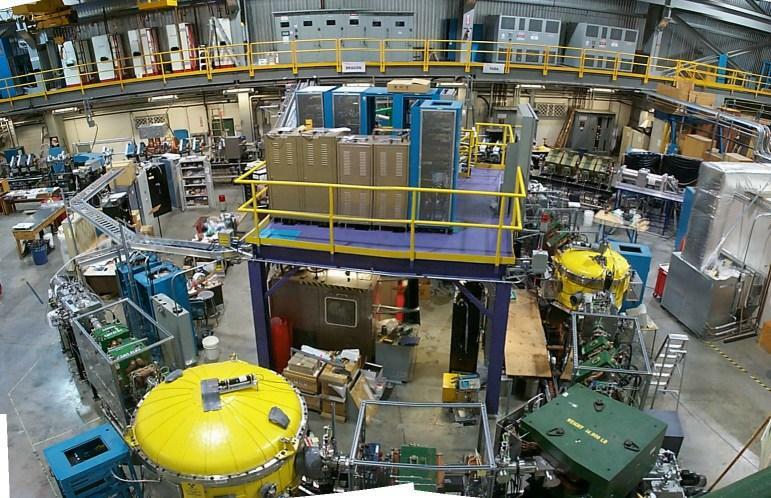 First Author’s Institution: Cyclotron Institute, and Nuclear Solutions Institute, Texas A&M University, TRIUMF, Canada, and University of Surrey, United Kingdom. Today’s post was guest authored by Sara Ayoub, a Ph.D. student at Michigan State University and the National Superconducting Cyclotron Laboratory (NSCL). Her work focuses on experiments in nuclear physics that address questions about the origin of the elements in the Universe and elucidate explosive nucleosynthesis sites like novae and X-ray bursts. She is currently helping to test and commission the Separator for Capture Reactions (SECAR), a new recoil separator for the MSU’s Facility for Rare Isotope Beams (FRIB) optimized for measurements of low-energy capture reactions of importance for nuclear astrophysics. Classical novae are commonly observed in our galaxy. These powerful events happen when a white dwarf in a binary system accretes material from a hydrogen-rich main sequence companion, until temperatures and densities are high enough that it ignites thermonuclear explosive burning on the white dwarf surface. We know quite a bit about these objects, but some things still don’t match up to our calculations. For the first time ever, this paper uses experiments – real nuclear reactions performed in the lab – to help address some of these problems. In order to understand these explosions, computational nuclear astrophysicists model them using complex reaction networks that, using initial parameters such as mass and composition, give the final abundances of the nuclei produced by the nova. Although we are able to model the structure and dynamics of these explosive events, we still predict final abundances that do not agree with what we observe in their spectra. This is where we need experiments. A likely cause of this disagreement is the nuclear reaction data used in the models. The stellar rates (the number of reactions happening in a cm3 per second per mole) of the reactions happening during the explosion are an important input since they determine how the abundance of each nuclei evolves over time. Most reaction rates important in novae have not been experimentally measured, and are only estimated from statistical models. 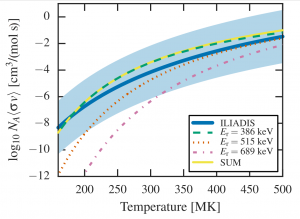 This in turn introduces large uncertainties in the models’ nucleosynthesis predictions. Therefore we need to have precise, experimentally derived, measurements of the rates. In 2002, Iliadis et al. 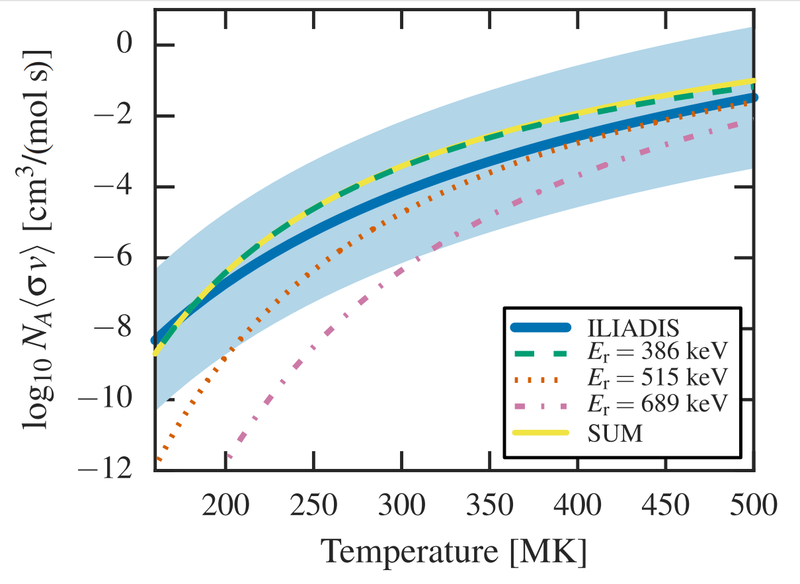 varied 64 nuclear reaction rates within their (usually large) uncertainties, and their effects on seven different nova models were studied. It was found that the proton capture of 38K producing 39Ca had a significant influence on the production of Ar, K, and Ca. These elements varied by factors of up to 60. Since this rate was estimated entirely from statistical models, this motivated the authors of this paper to provide the first ever experimental measurement. The paper introduces the first ever direct measurement of the rate of proton capture on the potassium isotope, 38K. It is important to note that 38K is radioactive, and to directly measure a capture reaction at this mass with a radioactive isotope, you need a radioactive beam hitting a target made of protons (hydrogen gas). 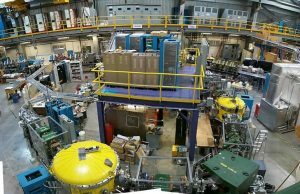 That is exactly what the authors used at TRIUMF, Canada’s national particle accelerator center that specializes in producing extremely intense beams of particles. A 38K beam was accelerated to energies corresponding to nova temperatures (4×108 K), towards a hydrogen gas target, where some potassium nuclei captured a proton and produced 39Ca. These very rare capture events were detected with the help of a “recoil separator” called DRAGON, the Detector of Recoils And Gammas Of Nuclear reactions. DRAGON acts on the beam and the reaction products like a prism acts on white light. The magnetic and electrostatic elements that DRAGON is composed of separate out the small amounts of 39Ca produced (the recoils) from the large amount of unreacted 38K beam particles. This makes it possible to detect them and therefore directly derive the rate of the reaction. The results obtained reduced the uncertainty in the rates from a factor of 104 to a factor of about 40! This represents a huge, 20:1 reduction in our uncertainty about how potassium proton capture works. Using these newly derived limits of uncertainty in the same sensitivity study previously performed by Iliadis et al., it was found that the effect of this rate on the production of Ar, K and Ca was reduced to a factor of 15 or below. These results indicate that this reaction is not a likely source of significantly enhanced quantities of Ar, K, and Ca, relative to solar abundances. This means that the overproduction of Ar and Ca observed in the spectra of nova ejecta…remains unexplained. It is therefore crucial to look at more rigorous sensitivity studies that might lead to new experiments, and at model calculations and possible problems with observations.